Ice is symbolic. Even when there’s not a body in it. In Hulu’s miniseries Cardinal, based on the book series by Giles Blunt, there is a body in it. The body of a young girl, preserved enough by the freeze to make clear to the troubled detective who’d overseen her disappearance case (until his C.O. called off the search) that this death was not only murder. It bears the hallmarks of a “repeater”—a serial killer. 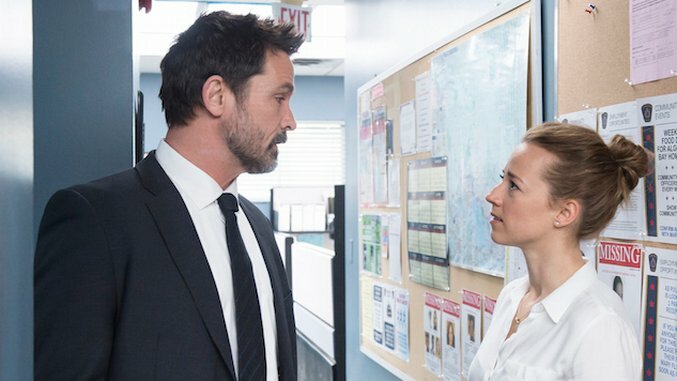 The Algonquin Bay police are used to John Cardinal (Billy Campbell) obsessing, ruminating, fretting, and generally chewing unsolved cases to pieces. In fact, they are used to Cardinal being a bit of an enigma himself. So no one’s surprised when he starts hawk-eyeing every suspicious death and missing-person case on the books for signs of a connection. The dead girl had been his case, initially. He’s taking the whole thing pretty hard. Also, it looks like he’s right: The murder wasn’t random or a standalone, and a serial killer is still at large. Cardinal’s also got a new partner, Lise DeLorme (Karine Vernasse), a fresh-faced newbie who’s been transferred from the financial crimes division. She’s investigating Cardinal for corruption, but the circumstances under which she is doing it might also be… corrupt. It looks like he might have tipped off a drug lord just before a big raid, even though that seems out of character. It looks like he’s laundering money, only it also looks like he’s not. One thing’s for sure: deLorme doesn’t trust the guy. At first. Ice is symbolic, and we speak of breaking it in social or professional situations for a reason. Actually, Cardinal had me unconvinced at first, but I warmed up to it because of the delicate precision with which it anatomizes people uncovering one another’s hidden layers and buried secrets and old traumas. I was convinced I was going to be seeing a conflation of weary tropes—hard-bitten cop faces serial killer; fresh-faced novice confronts corruption; Even Murderers are Colder in the North—grim subarctic scenery and nasty things buried in basements. The title sequence has images of the main character’s faces peeling away like birch bark; it seemed preordained to be heavy-handed and relentlessly grim. There totally are nasty things in basements, by the way, but the pacing saves this miniseries from cliché. It’s spare and taut and… well, cold, doling out little hints of humanity in its characters just often enough to keep you guessing and tantalized. And it’s not a “whodunit,” really, because we meet and track the killer (and his apprentice!) from fairly early on. So the tension does not arise from wondering which of the blank-faced townsfolk has a hideous secret. The worry over whether they’ll find the psychopath before he kills his next victim is appropriately uncomfortable, but the real tension exists, as it should, in the relationship between Cardinal and deLorme, as they go from mutual distrust to having to rely on each other to—well, to seeing each other for who they really are and starting over. From being frozen to being partners. A few of the subplot lines feel like they’re unnecessary or doing too much heavy lifting for their pay grade: DeLorme has a very distracting marital-problem sub-story that feels distracting and strained. Sometimes, the amount of time we spend with the killers is… well, a bit boring, considering how grisly and icky it is. (As it turns out, psychopathy can become wildly uninteresting after a while.) But on balance, there’s a satisfying complexity level and good tension. And a well-balanced narrative empathy for the characters that goes a long way toward keeping Cardinal from being one of a thousand thousand police dramas. Ice is symbolic. It suspends, preserves, protects. It also suffocates, freezes, kills. It can be too thin to support your weight. Or your theory. It’s solid, but it isn’t. Cardinal is a thoughtfully written and well-acted drama. As a murder mystery or a cop drama (whiteout noir), it’s one of those shows that really won’t exclude you from the big cultural conversation if you happen to miss it. However, as an exploration of how people reveal themselves to one another, it’s pretty satisfying. Cardinal is now streaming on Hulu.